Bolt on Rubber Pads : SARL Maxima, Specialists in the sale and reparation of machines and accessories for the construction industry. Importer and distributor of both hydraulic and pneumatic equipment. Bolt on rubber pads are a more permenant way of converting your steel tracks to rubber. Bolt on rubber pads have pre-drilled holes or pre set bolts to fix them to your grouser plate. 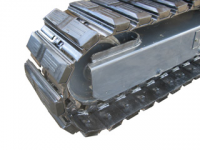 The bolt on rubber pad is specifically produced for environments where excavators are working against obstacles that could damage a clip on pad’s end clips. A typical example is on railway work. Please contact us for advice and help with bolt on rubber pads.